Head Professional - Craig Brown and his team of PGA Professionals offer a wide range of golf coaching services, catering to golfers of all ages and abilities. Visitors are welcome at Burleigh Golf Club. With access to our driving range, short game area, putting green and dedicated indoor coaching studio we provide professional coaching on all aspects of the game. We use the latest technology including FlightScope and video analysis to help improve your golf game. This program is suitable for anyone interested in starting to play golf or golfers looking for a refresher. The program covers the basic skills of golf including set-up, full swing, short game, bunkers, putting and a introduction to on-course play. Visitors are welcome and equipment can be provided at no extra charge. Go to the Beginner Golf page for class dates and registration. 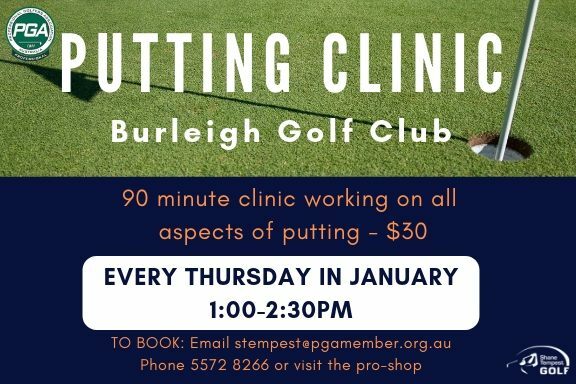 These weekly members clinics focus on a different skill each week. They are a great way to practice and improve under the guidance of a PGA Professional in a group environment. Junior coaching at Burleigh Golf Club caters for young golfers aged 5-15 years with a range of classes based on age and experience. For a list of current and upcoming programs, class details and registrations go to http://www.mygolf.org.au and type in postcode 4220.